SAILKARMA.COM - Sailing News, Videos and Photos! : BMW ORACLE Racing prepares for another round of testing. BMW ORACLE Racing prepares for another round of testing. SAN DIEGO, CA: BMW ORACLE Racing prepares for another round of testing. Following three weeks of modifications, the BOR 90 emerged today from the boatbuilding tent at the team base in San Diego. 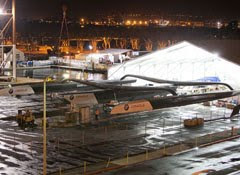 The latest iteration of the giant trimaran the team will use to challenge for the 33rd America’s Cup boasts new features which will be worked up on shore, before the boat hits the water for more testing near the end of the month. Most significantly, and in response to the new rules issued earlier this year for the 33rd America’s Cup by the Defender, SNG/Alinghi, the team has modified the BOR 90 cockpit to accommodate an engine. For the first time in the history of the America’s Cup, the Defender has altered the racing rules to allow using an engine to replace human power on board the race boats. Since the Cup’s inception in 1851, and in almost all other yacht racing, only manual (human) power may be used to trim sails and do other work. On BOR 90, the engine will primarily be used to drive hydraulics for trimming the enormous sails - the mainsail alone measures nearly 7,000 square feet - that propel the boat. Alinghi’s insistence on the use of engines has resulted in the team having not only to add an engine and related gear, but to redesign the boat’s cockpit on the center hull. With the engine, there is no longer a requirement for the grinding pedestals and sailors (“grinders”) who until now provided the human power for the boat, so the cockpit has been reconfigured. “When we originally designed and built the BOR 90, we assumed we would have to use the crew to provide all the power on board, as that has always been the case in the America’s Cup,” said design team director Mike Drummond.